Join me on Skillshare to learn the ins and outs of pattern design, product mockups, and wholesale! Are you a maker, designer, or artist interested in transforming your hand drawn and hand painted artwork into repeating patterns for textiles and products? In this class, Casey of Casey D. Sibley Art + Design will teach you the basics of using Adobe Illustrator to create seamlessly repeating surface patterns from your original artwork. Whether you plan to build a career as a surface pattern designer by licensing your work to other companies, or you want to build your own product line adorned in your pattern work (or both! ), you will enjoy this crash course in creating repeating patterns that retain the hand rendered quality of your artwork. ProCreate is a powerful, inexpensive, easy to use app that is ideal for creating digital artwork on the iPad, on the go! You can create many different styles of artwork using the app, and all you need is your tablet and a simple stylus (an Apple Pencil or fancy responsive stylus is NOT required). If you can dream it, you can draw it! In this class, I'll be walking you through my process for creating painterly florals on the iPad using Procreate. When it comes to launching a new product line, one of the most daunting tasks is making and photographing products for your website and catalogs...especially if you have multiple colorways, patterns, or styles for one product. It's expensive and time consuming, and you just want to start selling your awesome work already! Now you can master the art of the lean collection launch with this crash course in building product mockups in Adobe Photoshop. If you're an independent designer or small handmade business owner interested in venturing into wholesale, this class series is for you! You don't need and expensive e-course, or fancy equipment, or a marketing guru to help you create a successful wholesale line and strategy. All you need is a little planning and consistency to get your line into stores. Wholesale for Your Handmade BusinessPART III: Get the word out! If you make it, they will come...but you have to let them know you made it! 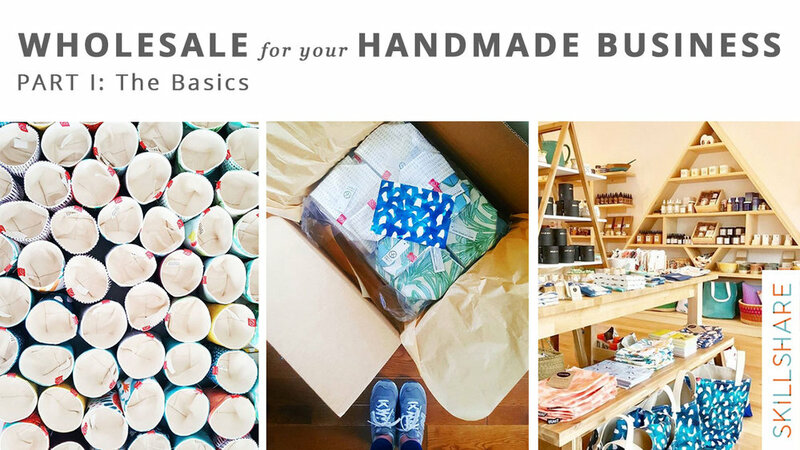 In the last class of the series, I'm sharing my best tips and strategies for researching, contacting, and attracting potential retail buyers for your handmade product line. You'll be set with the lingo and marketing materials to start reaching out to your dream stores and building your wholesale business into a sustainable income.